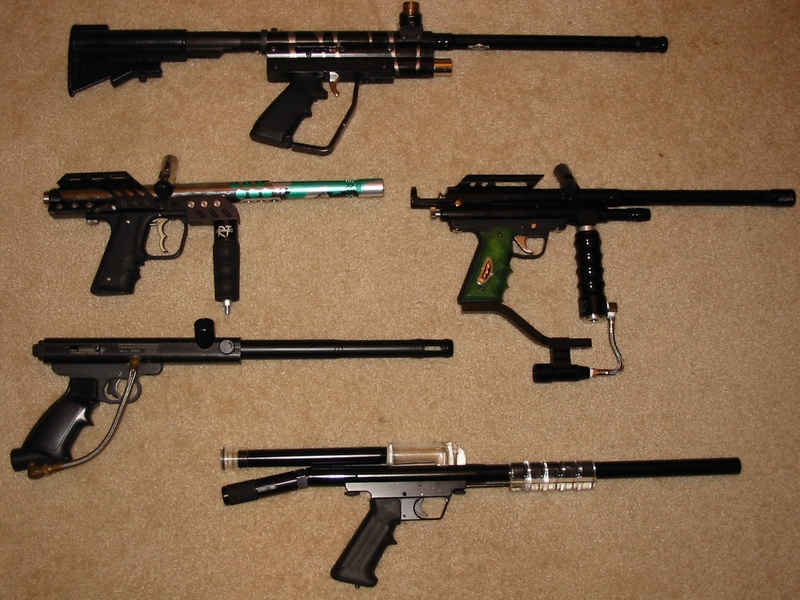 This page contains info on my personal paintball guns and equipment. I will also put up some information on the Western Michigan University Paintball Club that I run up here at school. My main mask is a black JT Flex-7 with chrome thermal lenses and a X-wind fan. I also have a PMI and a el cheapo backup masks. On the RT and sometimes the Piranha I run a ACI 3,000psi N2 tank with a ACI Bulldog reg. I run a Redz tank cover on it as well. I use a 12 volt revy on my guns but i have multiple backup regular loaders including a 300rd one. I have a ton of different barrels for each gun, ill list them all later. I use a Battleboy barrel bag. When I run a remote I use a PMI perfect remote. I also sometimes run a no-name 6+1 harness that I bought for like $20, but hey it works. I wear a JT sport jersey, black BDU pants, Fox yellow hat, triple eight knee pads, 2Xs sports half gloves, and either jungle boots or Vans skate shoes. I have a home made back holster for my P-68. I use a Ronin holster for the Eagle .68. I think thats it for gear. PMI Piranha "The Atomic Fish"
This is a 99 Mag RT that I just picked up 2 days ago from Pat. Bought it for $400 plus $25 for the Lapco barrel. 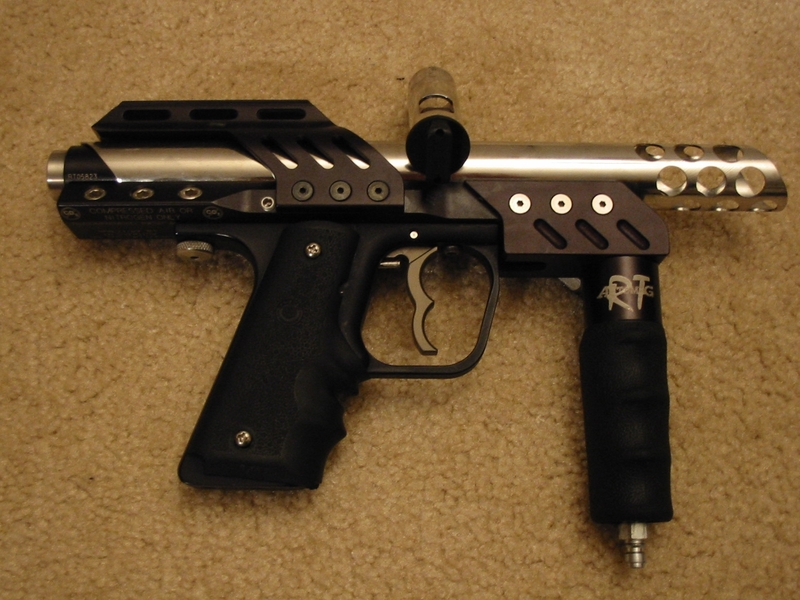 Its an awesome gun and my first really nice tourny grade gun. 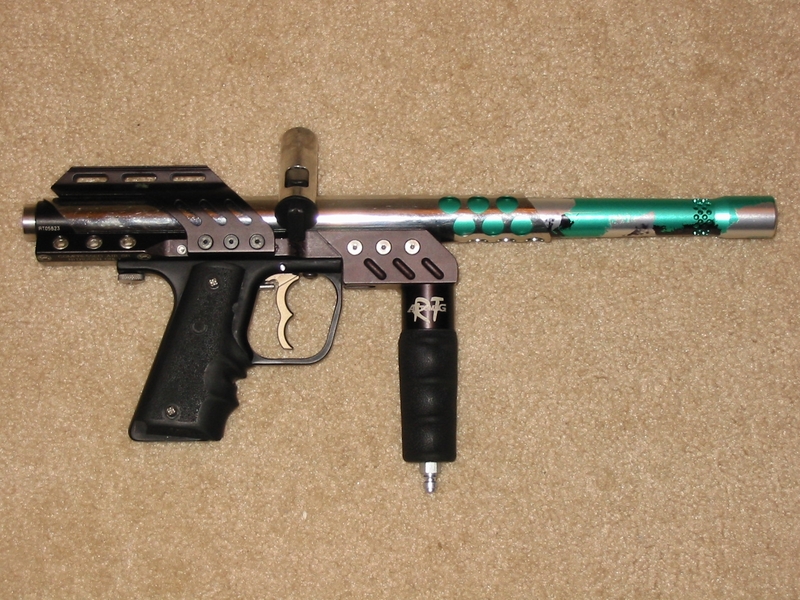 It has the regular RT internals, a Benchmark 2 finger trigger frame, Fat Boy rubber grips, the stock RT barrel and a Lapco Big Shot barrel thats ano'd green with black and silver splash. 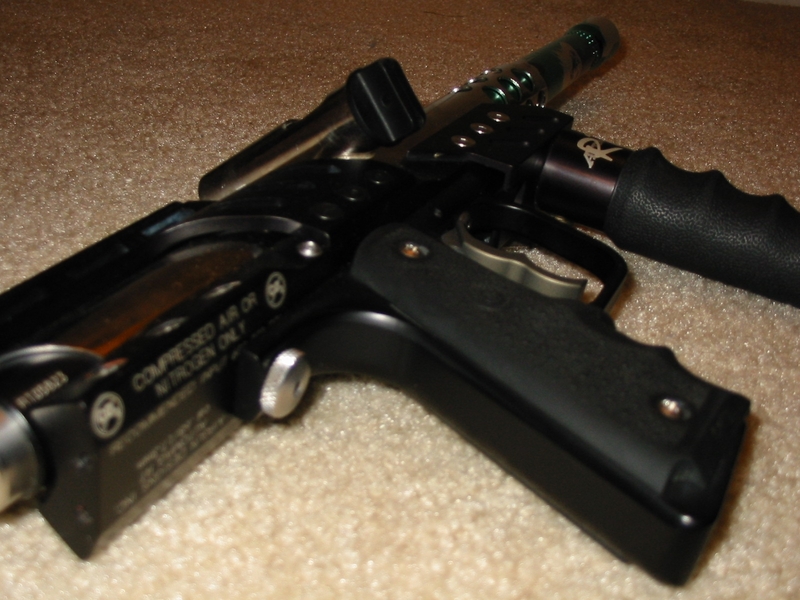 It shoots great and is SUPER fast. I love this gun!!! Its a beast, not much else to say. I feel in love with the VM the first time I saw one. 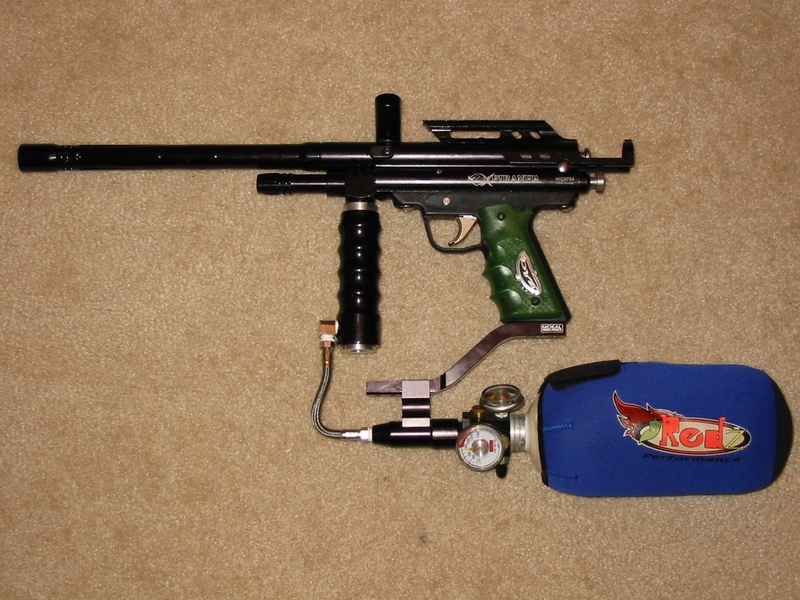 The tank under the barrel is just a sweet looking setup. The mods I have put on complete the look in my opinion. 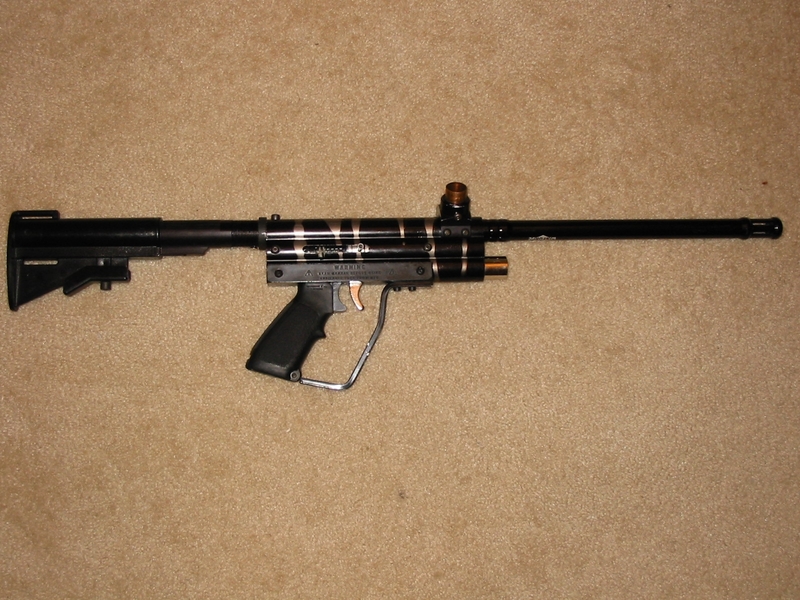 It has a pro-team external velocity adjust, a Taso Winforce 16" barrel, and a J&J Hardchrome 11" barrel. 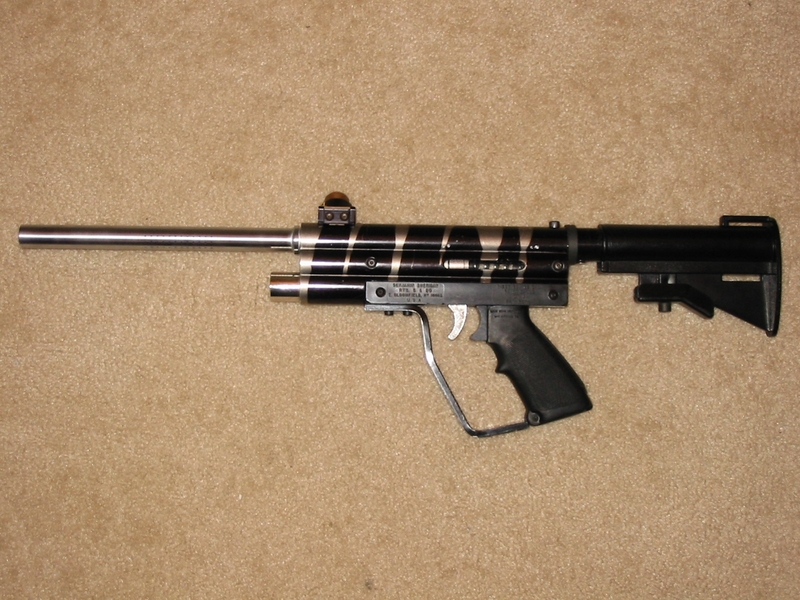 It also has a CAR-15 colapsable stock with a custom adapter made by GusDaDog. 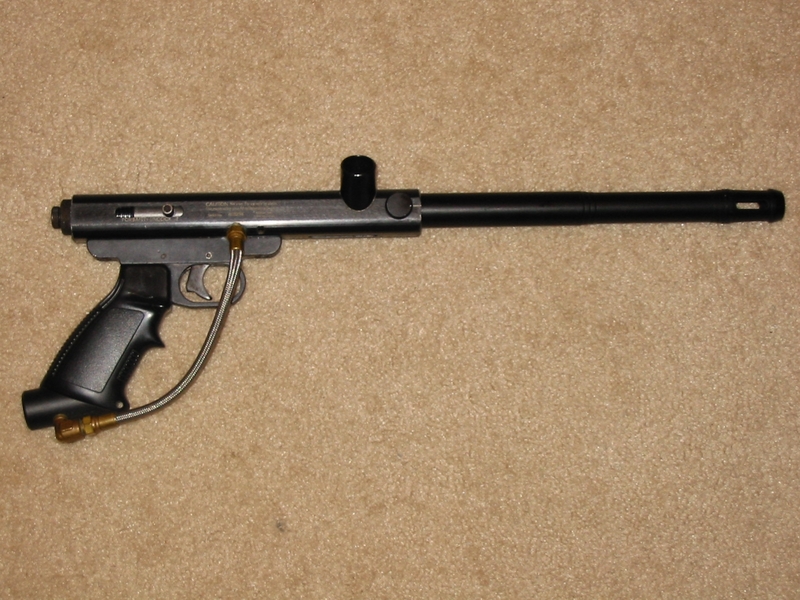 I love this gun, but I still have not used it in a game. Thats what this summer is for. The fish started off crappy bottom line powerfeed basic piranha and ended up as The Atomic Fish. It has a Shocktech deltrin bolt, Lapco bigshot, stock piranha, and stock ported spyder barrels, Madman spring kit, PMI ram air chamber, PMI turbo valve, TKO/Mokal cradle, ACI Sub-zero 6 stage x-chamber, PMI thumb velocity adjuster, green Dye sticky grip, and a PMI site rail w/ beaver tail. Sold at the end of february. My first gun. 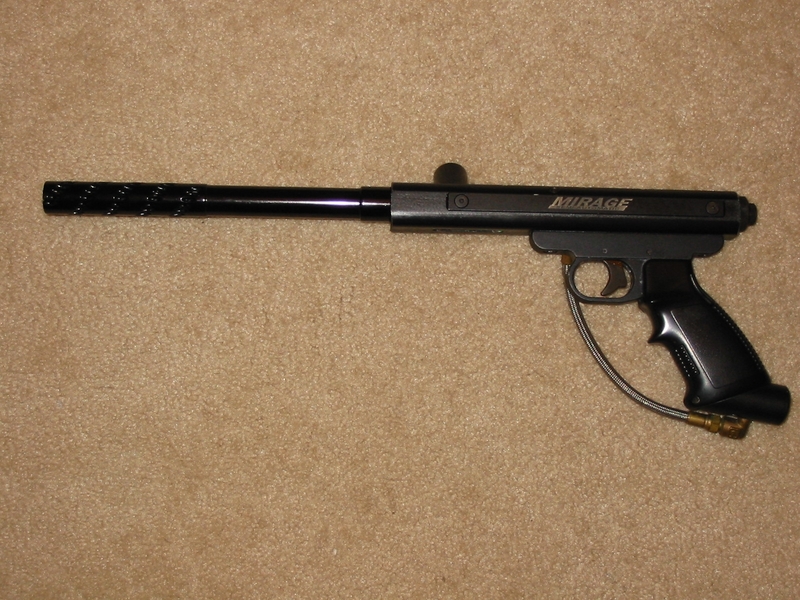 Its one of the few Mirages that I have seen that has never been a rental gun :) It has a slip in barrel system with a retaining screw on the side. The only mods for it are the barrels. I have an Armson 14" rifled and a Smart Parts Tear Drop 12". With the SP barrel, it is the most accurate gun I own. Dead on every time, the only problem is the super slow rate of fire because of the trigger setep. 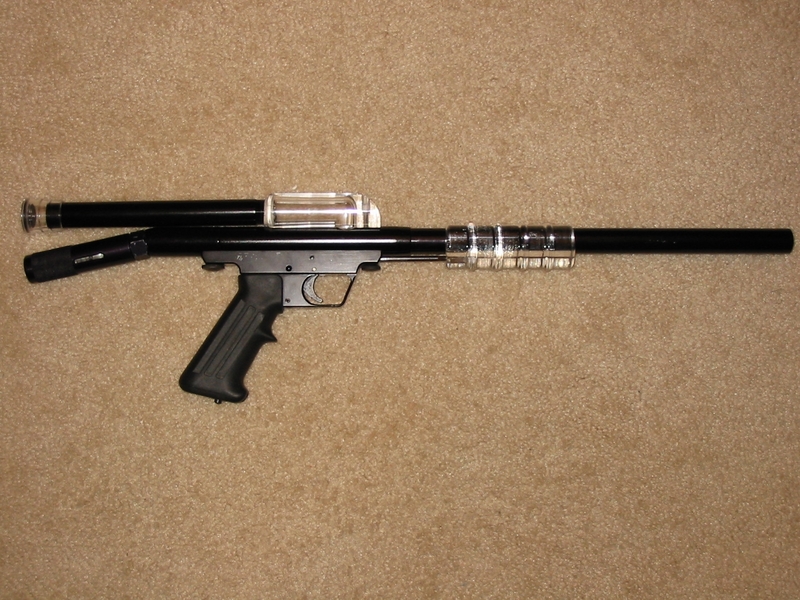 Its a great backup/sniper gun though. Ill probably never sell it. I began attending Western Michigan U in the fall of 99. One of the reasons that I chose WMU was that they had a paintball club. When i arrived here I found that pretty much everyone who had been in the club the year before had graduated. I decided to pickup the club's leadership role and I pretty much started with a clean slate. The first guy to come to my aid was Pat "GusDaDog" Triemstra. Pat was at WMU the year before I got here and he had been in the last club. He really helped me out by providing advice and just basic paintball knowledge. On top of that he normally has the hookup on anything I need and if he doesnt have it he tells me where to get it. Check out his site on the links page, its got tons of cool stuff on it. So anyway, the first year the club stayed pretty small but we had fun. In the spring of 00, one of the profs here at WMU that played ball as well took me out to a field in Three Rivers called Splatmandu. Its a renegade field set up on 24 acres. It consists of 4 fields, the city, the hornets nest, the painted forest, and the mine field.